Pretty good rule of thumb: if you see Sid Meier’s name attached to a game, you’re probably gonna be in for a good time. Whether it’s a piracy simulator or designing golf courses or creating an empire from scratch and later sending it to colonize outer space, ol’ Sid knows how to make what should seem like overwhelming concepts into extremely streamlined, and more important, fun games. 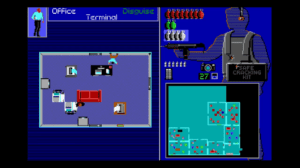 So when Sid and the fine folks at Microprose decided to take a whack at the world of international espionage, one goes into such a game with rather high hopes, and so, we shall, with Sid Meier’s Covert Action, released in 1990 for MS-DOS. Offices are solid sources of evidence. 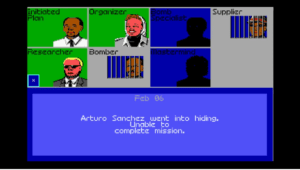 Covert Action puts you in the shoes of a roving CIA agent dispatched around the world to investigate various plots being hatched by terrorist organizations and put a stop to them (and in a surprising nugget of realism, you’re not going after fictional groups, either, actual organizations like the Shining Path and the Palestinian Liberation Organization are amongst the players here). 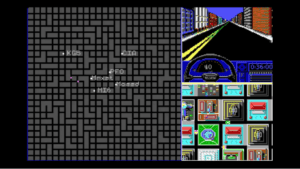 Now, your ultimate endgame is to apprehend all 26 masterminds behind these terrorist squads, but obviously, you’re not gonna be able to aim for the top right away, leaving you to work your way up the ladder. When a case begins (and it should be noted, there’s not really a single overarching narrative here, cases are generally Mad Libbed from basic ingredients randomly), you’re given a bit of background knowledge about the plot itself, the participants, and the locations involved, with slightly more intel leaked to you if you’re playing on a lower difficulty level. From there, it’s up to you to ascertain the depths of the scheme, build a case against the plotters, and bring them in for justice. You won’t be able to dawdle and futz around every potential lead, either; you’re very much working against the clock and vital links in the conspiracy can and will slip into hiding if you can’t catch up to them in time. What you do have, though, is an appropriately secret agent-y set of skills to help you build your case as well as point you in the right direction to move up the hierarchy. When you arrive in your target city, you can check into the local CIA branch to see if they have any useful local intel, at the cost of a few hours of game time. From there, you can pull up to the area hideout for whatever group you’re investigating, where you’re faced with a number of options. You can watch the building, to see if any persons matching a suspect’s description leave, giving you the possibility of tailing them and seeing where they lead you, placing wiretaps, which intercept incriminating messages that both supply you evidence to make arrests and link members of the conspiracy, or you can eschew subtlety and bust in, physically searching the building for hard evidence, bugging rooms and computers with listening devices, and arresting suspects hiding within. 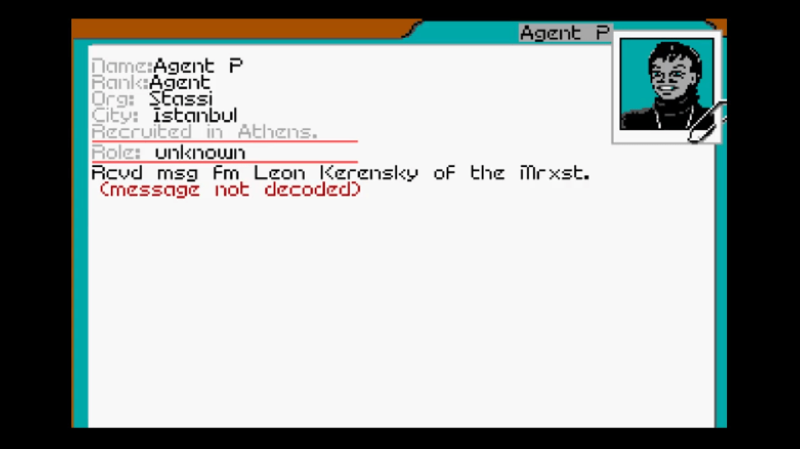 Last, but not least, you’ll sometimes encounter coded messages during your missions which have to be cracked at the CIA’s cryptology labs, and can break a case wide open. Basically, what this means is that your investigations break down into a series of minigames. If you elect to tail a subject, you’re given the choice of two chase cars, with attributes like speed and how conspicuous they are, that you can switch between during the chase. If the suspect realizes they’re being tailed, they will attempt to book it away from you and make it back to wherever they’re going unseen, so it pays to frequently switch cars and try to anticipate dead ends and other bottlenecks you can use to keep the subject in sight. 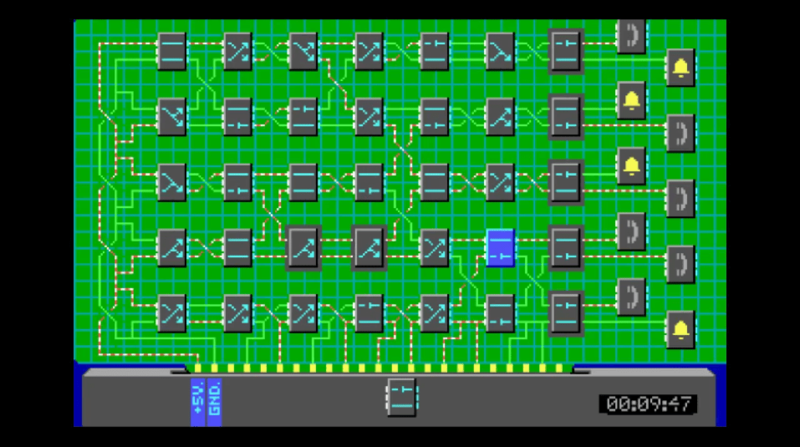 Wiretapping is presented as a puzzle game of sorts where you try to funnel electrical current into certain tiles with a phone icon on them while avoiding diverting current into alarm tiles. You do this by swapping out tiles at different junctions along the electrical grid that shift current between the various channels. I’m probably doing a terrible job describing it, but compare it to a Pipe Dream sort of game where you try to steer running water down pipes by swapping out intersections of pipe and you’d have a pretty good idea of what we’re dealing with here. It’s more intuitive than I made it sound, and can be quite a challenge as you move up the difficulty chain. 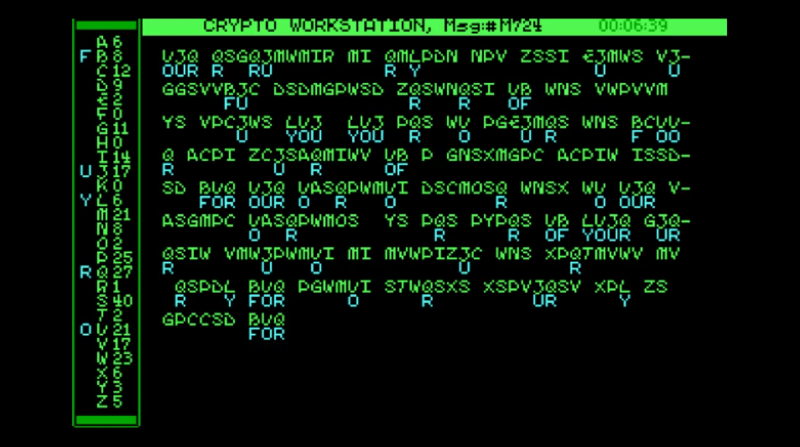 The cryptography section to decode messages is a basic letter substitution game; you’re shown the coded message on the right side of the screen, and on the left is a list of the cyphertext letters and how often they appear in the message, so a letter that appears far more often in the script is likely to be an E or a T, which gives you a good place to start. You can also get a hint that fills in a letter at the expense of some game time if you’re really stuck. Getting a rundown of how our case went. 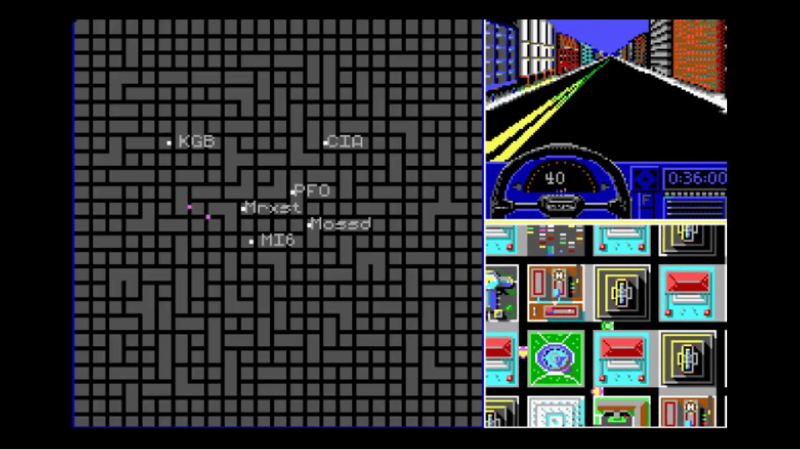 The most elaborate minigame, however, is where you infiltrate an enemy hideout. When you decide to engage in some hot B&E action, you choose from a variety of equipment to take in with you, ranging from an Uzi instead of the default pistol, a safecracking kit, bugs you can use to tap phones and rooms, a pocket camera that lets you document evidence, to various types of grenades. The odd thing, though, is that while you can bring in most everything with you, you can’t quite take all of it, and as far as I could tell, there’s no real reason not to bring the safecracking kit in favor of grenades, for example. When you’re properly outfitted, you’re put into a top-down action sequence where you navigate the various rooms of the building looking for anything you can to further your case, all the while trying to avoid or eliminate enemy agents guarding the building, lest you trigger an alarm that makes the odds far more one-sided against you, and you do not have the ammo to deal with everyone who might come your way. To that end, you’ll also want to be careful to cover your tracks, as even if enemies aren’t in the same room with you, if they stumble upon an office full of opened safes and file cabinets, they’re gonna know something is up. When you’ve looted the place dry, or arrested an enemy conspirator if they’re inside, you simply make your way back out the door. If things go bad, however, you can take solace in the fact that you can’t actually die. If you take too many bullets, you’ll be captured for a while and either have to attempt escape after several hours or exchange yourself for an enemy agent, and after your escape/release, you’re free to try again, but be warned: if you try breaking into a building repeatedly or fail at the wiretap section multiple times, the guards will be considerably more alerted, forcing you to either work around more guards or possible have to shake pursuers in a reverse version of the driving sequence where you have to escape back to the CIA branch without getting collided with. Not quite the chase from Bullitt. 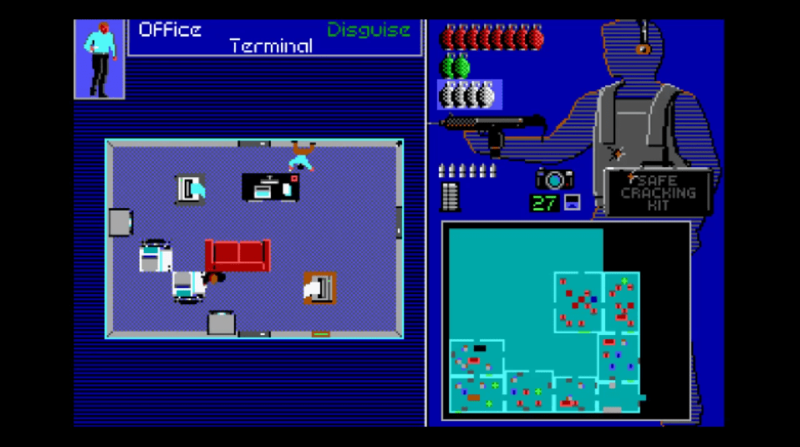 There are some considerable drawbacks with Covert Action, undoubtedly. First off, the controls, especially for the breaking-in sections, are not the most intuitive. Y’see, when you’re sneaking around an enemy compound, your movement is controlled by the numpad and most of your available actions are dictated by the Function keys or the Space bar, which makes for…a clumsy setup, at times, not to mention that if you’re playing on a laptop without a numpad, you’ll have to move around using the number keys at the top of the keyboard, and that is more than a little awkward. Secondly, as I said, there’s no real narrative to this game, and cases are just randomly generated each time, but the problem with that is that while no two cases will be exactly the same, they’re definitely gonna feel almost exactly alike in a lot of ways, and depending on your attention span, that can get repetitive sooner rather than later. Thirdly, and this might be more of a personal nitpick for me, you can kinda get the impression that breaking in is the most efficient way of gathering evidence, and that everything else is in a supporting role instead of being equally viable methods. Moreover, the actual amount of evidence you need to make an arrest stick is very minimal. You don’t really have to solidly prove someone’s place in the conspiracy and the physical extent of their involvement; literally showing them that they got a message from someone asking them to do recon of a target is enough to put them away, no matter how easy it would be for any self-respecting attorney to drive a truck through your case in actual court. 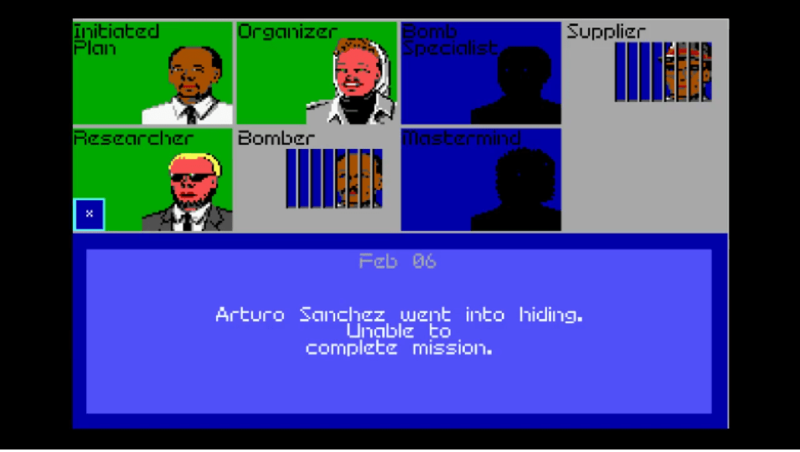 That said, the good definitely outweighs the bad here, and Sid Meier’s Covert Action is a solid-if-unspectacular secret agent sim. The various minigames add quite a bit of variety, and the randomly-generated cases do provide a ton of replay value, even if the mechanics of the game can get somewhat repetitive in a hurry. 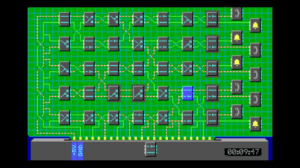 It looks and sounds like what you’d expect from a DOS game in 1990, so no complaints there, and despite the odd control scheme in some parts, the game handles very smoothly. If you’re looking to scoop this up today, you don’t have to troll abandonware sites, Covert Action can be found on Steam for the rather reasonable price of $6.99, and I would definitely recommend this one for anyone looking for a more involved spy game or someone who’s a fan of Sid Meier’s work in general. Nice variety of action, randomly-generated cases mean each playthrough will be at least a little different. While the cases change up, the general gameplay does not, awkward control schemes at times. This sounds like more of an elaborate Carmen Sandiego than I was expecting.